Free download Data Doctor Recovery Pen drive latest version also called Pen Drive Data Recovery is used to recover your memory stick data which has formatted, deleted, missed or lost. This software restores and retrieves all that data which has been deleted or formatted accidently or if you have deleted or formatted it yourself. 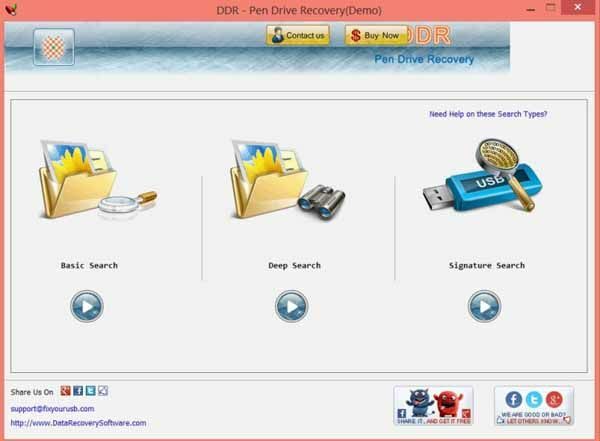 Data Doctor Recovery Pen drive software recovers almost all types of files includes your pictures or photo even they are individual or in folders, video and multimedia files, music or audio files such as songs and sound tracks and even the directories of your pen drive. The software also can recover damaged files because of virus attack or any file system error. DDR software can recover your crashed usb flash, memory stick, dongle, external usb hard drive, jump drive and other removable drive.